This post contains affiliate links, which means that if you click on one of the product links and make a purchase, I’ll receive a percentage of the sale as compensation. The good news? It doesn’t cost you any extra! All opinions are my own. Imagine for a moment that there was a magical place where you could share your website links… then in a few months, visits to your website would start multiplying exponentially. 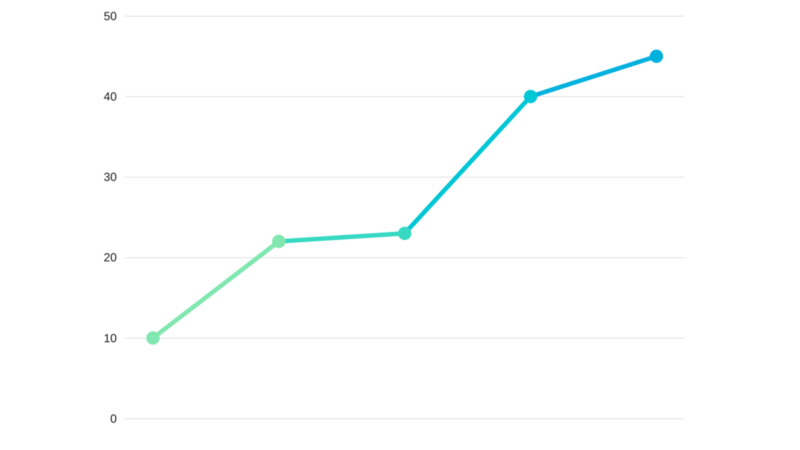 30 visits, then 60 visits, then 200 visits… then thousands of visits to your website each month. JUST for sharing your links?! Well, it actually does exist, and it’s called Pinterest. 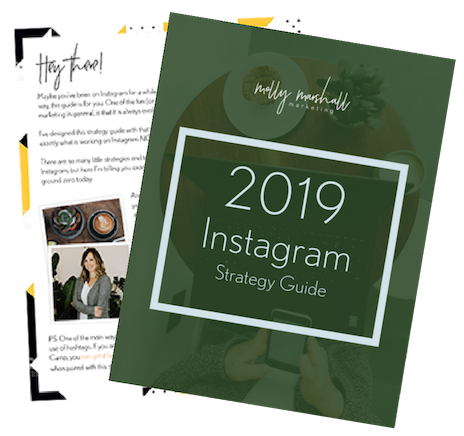 I’ve been managing social media accounts since 2008, and I am well aware of the rigors of keeping those social media queues full of high-quality, engaging, shareable content. Content has a short shelf life on platforms like Facebook, Google+, Twitter, and Instagram. Back in 2010, I was a beta user of Pinterest when it was invite-only. Fast forward a little bit, and I’m ashamed to say that I didn’t put those two things together until about April 2016. Sure, I’ve always used Pinterest to save recipes, workout ideas and fashion inspiration… but I never thought of it as a great platform for businesses that weren’t in one of those categories. I was wrong. It was Peg Fitzpatrick at Social Media Marketing World in 2015 that said something to the tune of (paraphrasing here), “It’s the social media platform that just keeps growing and giving and doesn’t expire.” Ok, you had me at “doesn’t expire.” Share once, and reap the rewards forever. However, it still took me almost a year to really dig in and figure Pinterest out for myself. 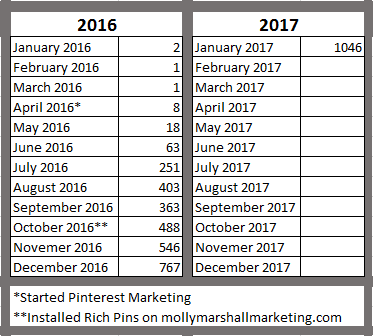 In January of 2016, I was ignoring Pinterest as part of my marketing strategy, and I got a measly 2 visits from Pinterest that month. In April, I got serious about Pinterest marketing. Fast forward to January of 2017, and I got a whopping 1,046 visits! 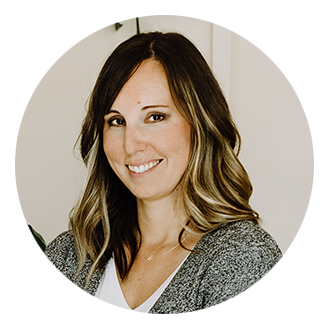 Of course, the number of website visits doesn’t tell the whole story of my business, but I can also tell you that my email list opt-ins have gone way up, and I have a full portfolio of social media management clients. Pinterest is working for me. You can also see on the chart, that after I (finally) installed Pinterest Rich Pins on my site, things really started to take off. This is another, “I wish I would have done that sooner,” moments. If you are using Pinterest for business, you need a business account (as opposed to a personal account). If you aren’t sure what you’ve got, simply log in and see if you have “Analytics” and “Ads” menu items in the upper left corner. If not, then you have a personal account. To switch from a business to a personal account, or set up a new account as a business account, follow these instructions for creating an account from the Pinterest help center. A business account gives you access to valuable analytics, the ability to put Rich Pins on your website, and the Pinterest advertising platform. Once you have your business account all squared away, the second thing I wish I had done from day one was to apply for, and install Rich Pins on my website. You can see in the table above that when I installed Rich Pins in October of 2016, my website traffic started growing more rapidly. There are a handful of Rich Pin types (Articles, Recipes, Places, Products, etc.). For a blog, you would want the Article Rich Pin. For an e-commerce site, you would want Product Rich Pins, etc. Rich Pins simply make your content stand out with a bolded title and your website as the author. I don’t have hard data that says, “Rich Pins get pinned X% more often than non-Rich Pins,” but I can tell you that in my analytics, my Rich Pins are ALWAYS the top re-pinned and clicked content. Rich Pins work. This image shows a Rich Pin (on the left), and a regular pin (on the right). While setting up your Pinterest account correctly and getting Rich Pins on your site might feel daunting and time consuming, once you are all set up, monthly maintenance of Pinterest is minimal. Especially when you compare it to the time and energy you spend on other platforms, and what you get back from them in terms of website traffic. Pinning at least 15-30 pins every day will really start building some momentum for you. In reality, I actually pin much more than this now, but in this post, I’m just trying to give you a place to start. Using a (affiliate link ->) Pinterest scheduler, like Tailwind app, can really help by allowing you to set up a large batch of pins all at once. More on this in a later blog post! 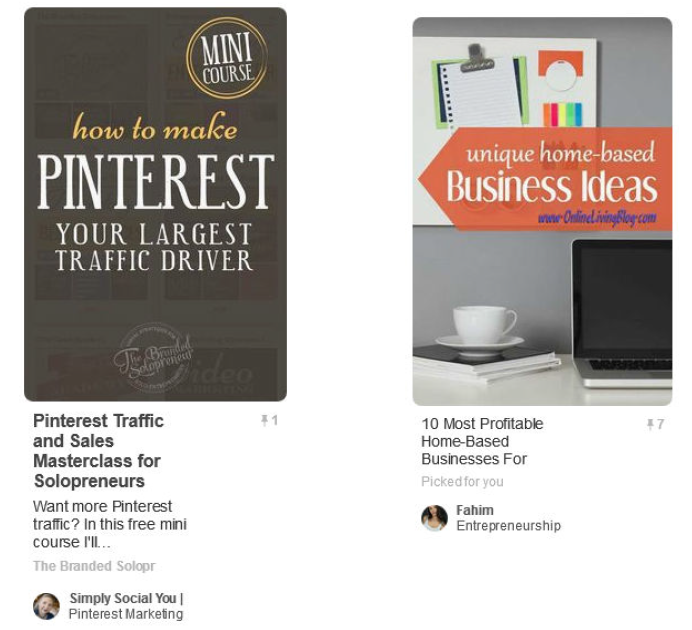 There are obviously dozens, heck, maybe hundreds, of little tactical tips I can give to help you grow your traffic from Pinterest. This post is just the first in a series of “Using Pinterest Marketing for Business” blog posts, but I wanted to kick things off by framing why Pinterest is so important to you as a blogger or business owner. It really is the one platform you should not ignore. Are you itching to get started RIGHT NOW? If you are ready to kick off your Pinterest marketing strategy, even if it’s imperfect to start, I’ve created a special 10-step checklist for you. Download it and do these 10 things today to get started on Pinterest and start reaping the traffic rewards today! Then stay tuned for my Pinterest marketing blog series. Have you used Pinterest marketing for business? If not, what’s holding you back? Pinterest isn’t something we are too familiar with so thanks for sharing your experience of using it. What about someone that has a filmmaking business? could this strategy works for a person to bring traffic to his website? My husband is not very familiar with Pinterest. So obviously he will need a business account and start to save pins of anything that he likes, right? Thanks for any assistance that you can provide. Thanks, molly, we have just started our agency for social media marketing and Pinterest is vital as we can see results straight away. When you Pin right and Pin consistently Molly the possibilities are endless, traffic-wise. Tight knit group of folks over there who enjoy supporting one another. Tweeted for you. Hi, thank you. I learnt something new tonight.